It’s 40 years since the term Lifeboat Ethics  was first mentioned, regarding the worlds ever diminishing supply of natural resources. Also in those 40 years the global population of bees has halved . So too has the number of wild animals. ‘The Lifeboat Frequency Of Bees’ is a sound performance and installation that attempts to apply the ‘Lifeboat Ethics’ to bees and not humans. Sonically examining how our cities, urban spaces have become the ‘organic lifeboat’ for many bee species, birds, animals and other insects. All living things, escaping from a ‘ocean’ of pesticide drenched fields, genetically modified crops and industrial pollution. All replacing the once traditional farming in the countryside. During the residency onboard UNISON I will be collecting different types of honey from around London to create a floating ‘bee frequency apiary’ installation, using the ‘Hive Synthesiser’ by Bioni Samp. Inspired by bee frequencies and the electrical resistance of honey. ‘I was trying to create a musical instrument based around bees droning, which was a bio-electrical hybrid. I needed some sort of organic resistors in my ‘Hive Synthesiser’ And was trying propolis  in a water solution’. Propolis is a red or brown resinous anti-fungal / bacterial substance collected by honeybees from tree buds, similar to Tea Tree oil, used by bees in the hive to fill crevices and to fix and varnish honeycombs. ‘This failed at first because the water is a super conductor and makes the current pass from one honey tasting stick to another instantly. But when I mixed the propolis with a jar of my runniest honey it worked. This honey I tested at about 17.5 % percent water, making a perfect resistor for integration anywhere in the signal chain of my ‘Hive Synthsiser’. 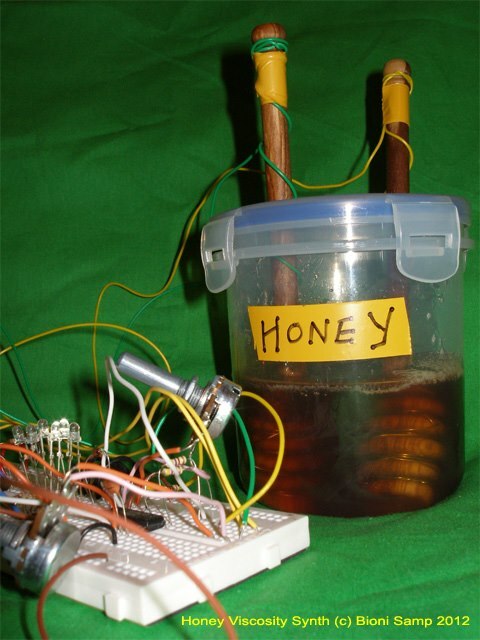 The honey as a resistor, can speed up and down sequencers, change oscillators pitch, playback bee samples / partials, sounds via Bela, even dim or brighten LEDs’. ‘Before the rational framed hive, before industrialisation, before ecocide, there were bees and their sounds. Listening to the gentle buzzing of bees is known to have a calming effect… But bees can be angry too… Bees are the sentinels of our ecosystem, our pollinators, our society blueprints… and more’. The ‘Lifeboat Frequency Of Bees’ performance attempts to create a symbiotic frequency relationship, like those between pollination and nectar exchanges, or between beekeeper and bees. Samp performs with his ‘bee frequency electronic apiary’, a sound installation set up during his residency where harvesting (recordings), processing (audio) and distributing (listening) take place via qr code ‘seed’ cards. Samp has been building his ever expanding modular ‘Hive Synthesiser’ and collecting bee hive sounds from London, Sweden, Slovakia France, Linz, Scotland. Bee recordings are amplified inside the tube of the log hive, the distorted sounds reverberate off the circular walls and are projected outward. The simultaneous international bee voices across Europe call our attention. Collectively they are a loud global protest, a link to the past, to an active, sustainable connection with nature. ‘During my residency onboard UNISON I will be collecting different types of honey from around London to create a floating ‘bee frequency apiary’, in an attempt to raise the vibrational energy & empathy of humans towards planet earth & all things bee’. This work furthers my ‘Bee Frequency Farming’ research started on STWST Eleonore, Linz and STWST48 during ARS Electronica 2015. The residency has begun. I have been visiting the boat most days and spending time making stuff for the installation, like these ‘Colour Bee Comb’ drawings and wiring up a few synthesiser parts. It’s been pleasant floating on the canal when it’s sunny in the afternoons as the autumn temperature drops and the nights draw in. Transcendental Meditation on the boat is attained when looking into the bee comb for a while. The six geometric sides remind me of sculpting polygons in 3 D programs, quickly they become mandalas, with many mathematical questions. Performance ‘aktions’ included: Tasting this years honey. Giving Bee friendly seeds out to guests. Performing with my ‘Hive Syntheiser’. Inviting guests to play with my ‘Hive Synthesiser’. ‘Hoisting the Beeframe’ & ‘Keelhauling’ Pesticide Companies.